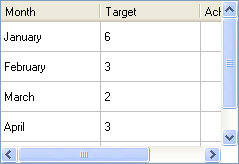 I'm using Qt4 to create a table, using the QTableWidget class. These are actually QTableView's methods. Since you use a QTableWidget which is a child of QTableView, everything works out. inherited from QTreeView. It was introduced in Qt4.4. Not the answer you're looking for? Browse other questions tagged user-interface qt4 pyqt or ask your own question. Is it possible to change the colour of a QTableWidget row label? How do you retrieve the cell row of a changed QComboBox as a QCellWidget of a QTableWidget?